READY TO KICKSTART A HEALTHY LIFESTYLE? Claim your free consultation below. Ready To Get Fit, FAST!? Get Started With A Free Fitness Consultation And Get On Top Of Your Fitness! We believe that when you choose to move your body, be it CrossFit, running, weightlifting, yoga, or gymnastics (and the list can go on), you’re choosing to live longer, healthier lives, both mentally and physically. At CrossFit Bounce we further believe that a person’s fitness journey is marked with extreme highs and lows that defines the word “Bounce.” When you embrace and own the road is not a perfect straight line, that it’s constant change in a lifelong process, you are better able to direct these highs and lows toward an overall progression towards your personal goals. The definition of CrossFit is easily found with a simple internet search. What you rarely find in those descriptions is that CrossFit will at some point challenge your fears and your personal demons. CrossFit Bounce’s supportive community and excellent spot-on coaching will empower you to face those fears. Your “I can’ts” become “I think I can,” to “I’ll try,” to “I DID”. They don’t tell you that CrossFit will strengthen you mentally so that you’ll no longer put limitations on yourself and actually aim higher than you ever thought you could because you’ll start to believe in yourself and your innate abilities. At Bounce, we have created and facilitate an environment where scaling and modifying the WOD (Workout Of the Day) is appropriate for beginner and intermediate athletes. Rx workouts (WODs exactly as written) are carefully prescribed to those with more experience who demonstrate proper mechanics and proficiency of movements, when we know they’re capable of safely handing the weights and skills within the workouts. Intensity is the key to weight loss, dropping body fat, increasing muscle mass and making performance gains. It’s when your workouts are appropriately tailored to you and scaled to your ability, that you achieve optimal intensity. Our programming in combination with our excellent coaching and our amazing community is what makes the Bounce difference and your path to fitness a successful one. One of our experienced coaches will be in touch to chat with you about your exercise history, health goals and to answer any questions you may have about starting training. Claim your free consult today to get the ball rolling. The road to success in your training starts with a solid foundation. 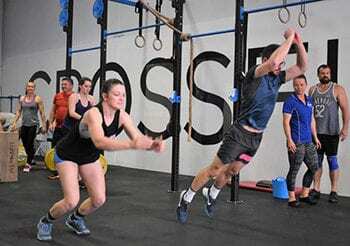 Spend 2 x 1-hour sessions with our experienced coaches to learn the fundamental movements of CrossFit. Once you have completed your fundamental sessions you will be ready for our group classes. Hungry for more? If you have completed the Fundamentals sessions then you are ready for CrossFit classes! This is truly where the magic happens! Our professionally trained, expert coaches actively coach each class you attend. Personal coaching like this would normally cost a fortune at traditional gyms but is included in all our memberships. At CrossFit Bounce, our community is our greatest strength. You’ll make lifelong friends to help inspire, challenge and motivate you. We train together, socialise together, and inspire each other to do our best and achieve our best! You’re more than a number to us! We want you to get the attention you deserve every session and that’s why all our classes are limited to 15 members at a time. Need to train but have kids in tow? No worries! At CrossFit Bounce we have a Creche’ with childminding at selected sessions. We also have a members lounge where you can kick back and enjoy the company of our awesome members pre or post workout. This is an optional service for those who love to lift! You have access to your own weightlifting club to practice your Olympic lifts under the guidance of our National Level Coaches.